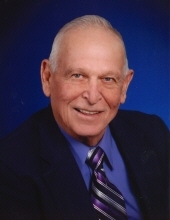 Roy Conrad Fath passed away on Saturday, February 16, 2019 at his home at the age of 86. Roy was born to George W. Fath and Leta E. (Fry) Fath on May 22, 1932 in Tonkawa. Roy lived his whole life in and around the Tonkawa area having been raised southwest of Tonkawa on the family farm. He attended Cottage Hill Elementary School and graduated from Tonkawa High School in 1950. Roy married Donna Rose McDaniel on February 13, 1952 and together they had two children, Nina Kay and Tony. They were married 45 years before her passing. In December 1997 Roy married Ona Mae Fruits. As a young man, Roy worked for a short time at Gruner Bits but always farmed. He enjoyed working on the farm, traveling, and telling jokes but perhaps his greatest joy came from teasing his grandchildren. Roy was survived by his wife Ona Mae Fath who passed away on February 20, 2019. He is survived by his daughter, Nina Kay Geschwind and her husband Ron, son, Tony Fath and his wife Jill, grandchildren, Mindy Geschwind, Karey Patterson, Brady Fath, Casy Fath, Stony Fath and 8 great-grandchildren, as well as several members of his extended family. He was preceded in death by his parents, his first wife, Donna, brothers, George Jr. Fath, Carl Fath, and Charlie Fath, and sisters, Alice Hodgens and Rosemary Schoelen. A memorial ceremony will be held on Thursday, February 21, 2019 at 11:00 am at the First United Methodist Church in Tonkawa. Honorary casketbearers will be: Stephen Patterson, Brady Fath, Casy Fath, Stony Fath, Dale Fath, and J.C. Fath. Memorial donations may be made to the First United Methodist Church of Tonkawa, 410 E Grand Ave, Tonkawa, OK 74653. Special thanks to Ascension Via Christi, Fresenius Dialysis, Visiting Angels of Ponca City, and Hospice of North Central Oklahoma for the care Roy received. To send flowers or a remembrance gift to the family of Roy Fath, please visit our Tribute Store. "Email Address" would like to share the life celebration of Roy Fath. Click on the "link" to go to share a favorite memory or leave a condolence message for the family.